I awoke early at around 4am after 7 to 7.5 hours of sleep. After my walk around the campsite the previous evening I had retired to my tent with the intention of reading and listening to music but had fallen asleep almost immediately and not woken until the light started penetrating the gloom in the tent and the birds started their usual cacophony. I lay for a while preparing to make a mental inventory of the various aches and pains I had expected from the previous day's exertions but was surprised to note that I felt in pretty good shape after an uninterrupted nights sleep. I lay for a while longer trying to go back to sleep but after a while gave up and made myself a coffee before making my way to the shower block. The campsite was totally still and silent apart from the birds and one caravan owner standing at his door smoking a cigarette as I returned. He bade me a very softly spoken 'good morning' but it was far too early for conversation and I just nodded and made my way back to the tent. After I had eaten, I decided I may as well begin packing up the tent, which was soon done and I was ready to start walking by 6.30am. 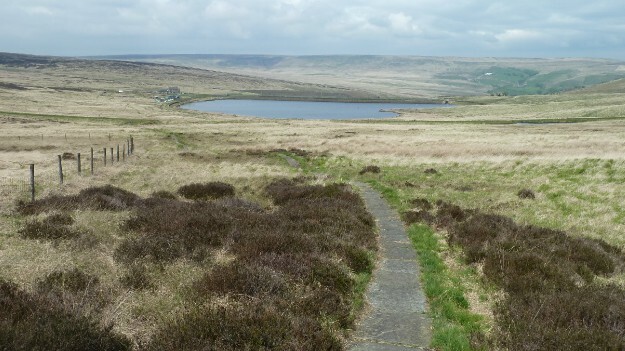 I quietly and slowly walked back along the steep access road leading from the campsite, allowing my muscles to warm up gently and soon reached the turn off for the Pennine Way. Part of me wanted to continue along the campsite access road to the main road and catch a bus back to 'civilisation' but as I climbed into the valley with Crowden Brook forming a thin silvery thread along the valley floor, I relaxed and began to enjoy the scenery and solitude and the further I walked, the more I became enchanted by it's beauty in the early morning sunshine. 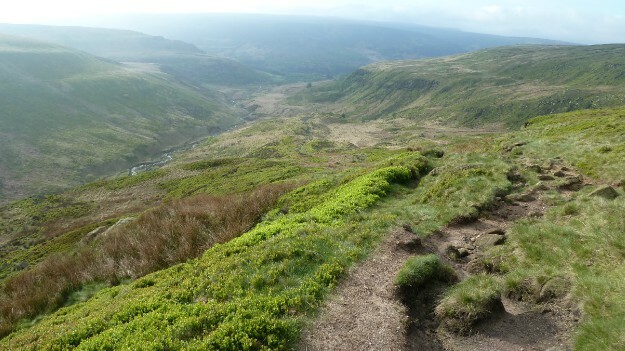 The walk between Crowden campsite and Black Hill was one of the most memorable sections of the trail as I walked in silent solitude, stopping frequently as I climbed to the summit of Laddow Rocks to look back into the valley below and admire the surrounding hills as they stood sentinel over the river running at their feet. 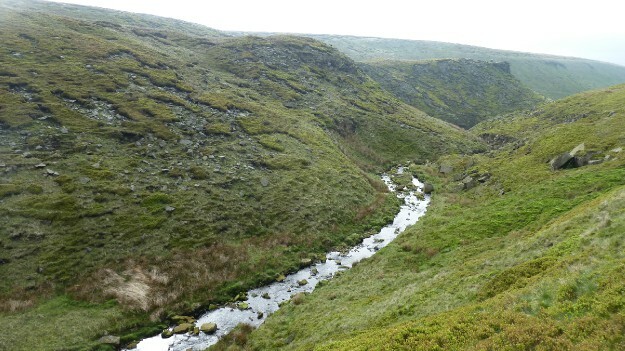 Leaving the summit of Laddow Rocks the way descended to Crowden Great Brook and followed it for a short distance before reaching a slabbed section that passed through a boggy area, the scenery now taking on a more typically moor-like character as the way headed towards Black Hill. Black Hill marked the end of the solitude for the day as the spell was broken by a woman walking her dogs who greeted me as I descended to a road via steep defile carrying a small stream and hauled myself up to the road, where my guidebook had mentioned the possibility of a roadside snack van. I had mentally prepared myself for disappointment but after 3.5 hours of walking, the thought of a hot snack and drink had spurred me on but sadly, my preparation proved to be time well invested as there were only a couple of cars in the layby with no sign of the snack van. I crossed the road and carried on into the Wessenden Valley on an easy track descending to the reservoir and watched a group of walkers climbing an impossibly steep hill across the valley as I sat for a break before suddenly realising that the path they were on was my onward route and I would soon have to negotiate the almost vertical slope myself. 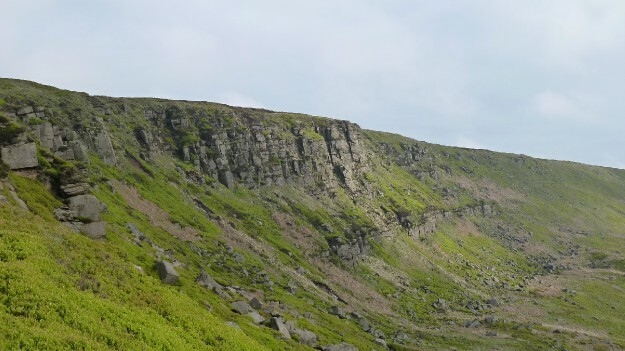 I consoled myself with the thought that I didn't have too far to go as I was only walking around eleven miles with far less ascent than yesterday's leg and I was also toying with the idea of taking a room at a pub once I reached Standedge. My tent's lack of waterproofing was still nagging away at the back of my mind as was the fact that my sleeping bag wasn't keeping me warm and after two nights camping, a proper bed sounded like an almost irresistible attraction. I decided to wait until I arrived at Standedge to make my decision as the pub also had a campsite so I could delay my decision-making until the last minute. Whatever happened, I had decided I would book a room in Hebden Bridge the following day regardless. I set off once again and climbed the path I had observed the walking group climbing, which did indeed prove to be steep but thankfully short and in the event didn't prove much of a problem. 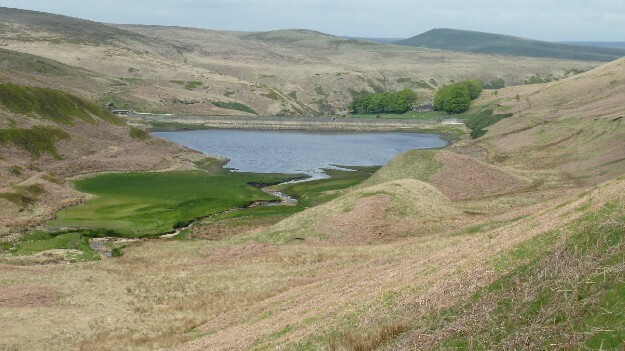 I soon passed the walkers as they sat having a rest break near Black Moss reservoir and before long, Redbrook Reservoir came into view, which signalled that the end of the days walk was near. 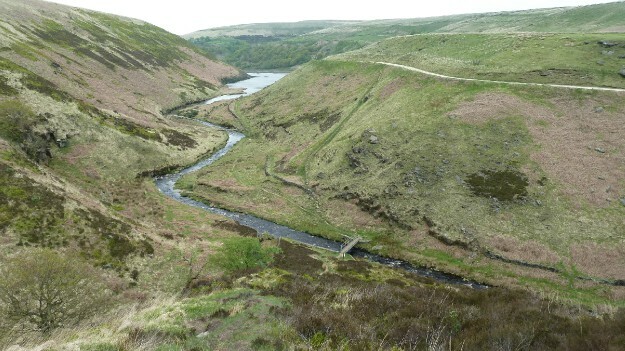 Soon, I left the Pennine Way and veered off on a path towards Marsden, before leaving it for a smaller path as it headed towards the Carriage House Inn where I planned to spend the night. Because of my very early start, it was only 1 pm when I arrived at the pub so I was not very happy to discover that the establishment didn't open until 5.30pm, a fact not mentioned in the guidebook. I thought about continuing the walk but the next realistic halt was Hebden Bridge which, at 14 miles, was too far to contemplate as an afternoon walk. The only other alternatives were to either walk into Marsden, which was around 2 miles away or wait until the pub opened. I decided I would wait and headed up the road to another pub which thankfully was open and I removed my boots and rucksack before entering the bar as requested. I ordered a beer and asked the woman serving if they had rooms but as I suspected, they didn't. I stayed for lunch and with my next beer, ordered a beef baguette, which came complete with gravy poured over the beef, something I hadn't expected and certainly wouldn't have received had I been in a pub in the south closer to my hometown. Despite my reservations, it proved to be delicious and I found myself wishing that I was staying at the pub as the staff could not have been friendlier. As the pub closed at 3pm, I made my way outside and wandered around Redbrook reservoir before finding a comfortable spot to sit in the sunshine with my back against the wall overlooking the water and dozed for a while. Later, I headed back to the pub to await the arrival of the owner who duly turned up just after 5pm and confirmed that they did indeed have a room, all thoughts of camping having now been erased from my mind. The room proved to be excellent, having recently been refurbished and I was overjoyed to see that the bathroom also had a bath tub, which I filled nearly to the top and wallowed in it until the water began to cool, my aching muscles now soothed by the hot water. Later, I headed into the bar for a meal and a few pints of real ale before retiring fairly early after a much easier second day.